Rev Dr Laurence AB Whitley who "aptly summed up the grief of the City of Glasgow after the disasters at Clutha and with the bin lorry," has died after more than four decades of ministry in the Church of Scotland. Dr Whitley was minister of Glasgow Cathedral from 2007, when he succeeded the Revd Dr William Morris, who remained a member of the congregation and whose presence each Sunday in what was regarded as the manse pew must have had an inhibiting effect. Glasgow Cathedral is not an easy church of which to be minister. It has a congregation drawn from a wide area of Glasgow and beyond. It has a long-established tradition of fine music and preaching. Meanwhile, it hosts so many special services for organisations and institutions from Glasgow and beyond, that it is seldom that the minister of the Cathedral is able to address his own congregation, its concerns and problems. Laurence Whitley’s background provided him with family experience of these problems, for his father, Dr Harry Whitley, was minister of St Giles’ Cathedral in Edinburgh and faced them all the time he was there. The Whitley Sunday lunch table was an ecumenical and international feast, because Harry Whitley frequently invited those he knew to be strangers from home or abroad to the manse for lunch: his wife seldom knew how many she was catering for and so the Sunday roast was always large. It was frequently placed in the oven after Mrs Whitley returned from church and so lunch was often delayed, while Harry Whitley plied guests with sherry (in the belief that it didn’t really count as alcohol!). However Sunday lunch was where Laurence Whitley met figures from the church, national and international. Having graduated in arts from Edinburgh, he moved to St Andrews to study divinity. Laurence Whitley was born in Port Glasgow, when his father was minister of Newark Parish Church, then educated at Edinburgh Academy, where his contemporaries included the future Moderator, Professor Iain Torrance and Kenneth Stevenson, later Bishop of Portsmouth. "I knew Laurence all his life. We began at the Edinburgh Academy aged 5. He was the most gifted and inspirational user of language in worship and one of our most imaginative and creative and gentle ministers. It was he who aptly summed up the grief of the City of Glasgow after the disasters at Clutha and with the bin lorry." The City of Glasgow recognised Dr Whitley's outstanding service in 2014 when Lord Provost, Sadie Docherty presented him with the one of the city's highest accolades, the Loving Cup. The award is reserved for a person or group who has brought distinction or honour to Glasgow. Dr Whitley was honoured for pastoral service to the city, presiding at civic events such as Remembrance Sunday. He was also praised for the comfort he gave to those directly caught up in the Clutha disaster, including survivors and staff who received emergency attention. As police chaplain, Dr Whitley visited the crash scene and the grieving, injured and shocked who were housed in emergency centres across the city. He also presided at a special service at the Cathedral, in the aftermath of the helicopter disaster, attended by leading politicians, emergency services and NHS personnel as well as those directly affected. Licensed to the ministry in the Presbytery of St Andrews, he then served his probationary year in St Andrew’s Church Dundee before being inducted to the linked charges of Busby West and Busby East. The two congregations had resisted all attempts to bring them together, and Laurence Whitley had the unenviable task of ensuring that they did not follow the example of a similar village where, as they said after a linkage, “there used to be two congregations and now there are three”. He spent ten years in Busby which not only greatly benefited the morale of the congregations but gave him his wife, Catherine MacFadyen, who was a member of one of them. His marriage also greatly improved the service at dinner parties at the Busby manse. Before he met Catherine, there were long gaps between courses. Slowly it became apparent to guests that the delays were caused by the minister driving from Busby to Clarkston to collect the next course for the meal from a restaurant there, then quickly making sure it was reheated. In 1985 Laurence Whitley moved to the parish of Montrose Old (now Old and St Andrews) when the previous minister James Weatherhead, as was widely expected, became Principal Clerk of the General Assembly. Montrose was undoubtedly where Laurence Whitley was happiest as a minister, and certainly at his most relaxed, and he was greatly loved. The surrounding countryside provided sufficient space for him to practise his bagpipe playing without disturbing the neighbours of the Manse. When Dr Whitley was called to be minister of Glasgow Cathedral in 2007, he was assured that the tensions, which were well known within the Church had largely been resolved, but it did not take him long to discover that this was far from the case. And some of his decisions did not ease these tensions. The ordination of women to the eldership in the Cathedral was a case in point. The eldership had been open to women “on the same terms and conditions as men,” since 1966, and in 1991 the General Assembly took a firm line in face of those who were “wrongly treating this provision as merely permissive”. The Kirk Session of Glasgow Cathedral was one such. It came as something of a shock to the considerable number of traditionalists in the Cathedral, when women were introduced to the membership of the Kirk Session, and when the Cathedral’s roof remained intact. Archbishop Mario Conti recalled that “in the decade of his ministry at the Cathedral”, ecumenical relations flourished. In Dr Whitley’s accepted role as the City’s Chaplain he brought together other Church communities, institutional representatives, and most significantly, members of the civic authorities under the patronage of the Lord Provost in a week’s programme of events around the date of the birth of the city’s Saint Mungo called Mongofest. In 2013 Dr Whitley published “A Great Grievance” a study of lay patronage in the Kirk until 1750, which the former Professor of Church history at Glasgow University described as “a very welcome contribution to the understanding of what was manifestly a chronic and debilitating problem in Scottish history”. 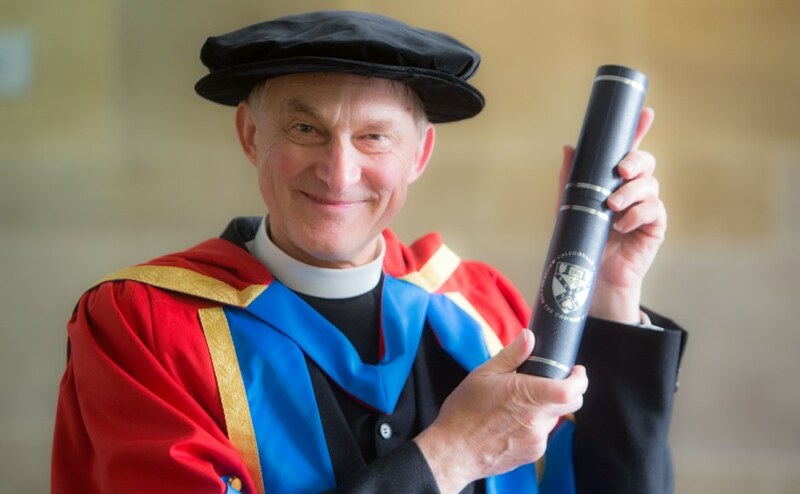 Glasgow Caledonian University awarded Dr Whitley an Honorary Degree of Doctor of Letters in 2015 in recognition of his "continued support of the City of Glasgow as Minister of Glasgow Cathedral, together with his contribution to the ecumenical life of the city." Dr Whitley is survived by Catherine, Edward and Hilary, his brother Michael and sisters Elizabeth and Mary. Obituary courtesy of Johnston McKay and The Herald with contributions from Rev Ian Taylor and Dr Whitley's family.